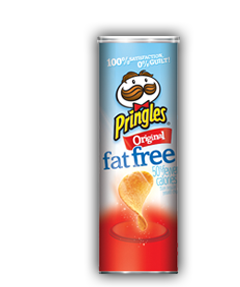 As Pringles snacks all look the same, you will find very similar reviews in the texture section. The snacks are very easy to describe. They are famously saddle shaped. The surface was bumpy but smooth. The colour was a very pale yellow that, if it were paint, would be described as 'White, with a hint of yellow.' There was also a lot of pale powdery seasoning. A Nose Plunge Test revealed much the same aroma as we found with Pringles Original. It was a sort of odourless yet potato smelling experience. A snack of this type without any fat seems a little scary, but we went with it and the flavour replicated the theory - it too, was somewhat lacking in taste and flavour.